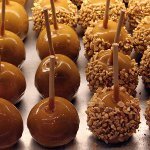 The National Caramel Apple Day is celebrated on October 31. It coincides with Halloween which is not surprising as caramel apples are one of the most popular Halloween treats. Caramel apples (also known as taffy apples) are made by inserting wooden stick into apples, then rolling or dipping the apples in hot caramel and allowing them to cool. Tart, crisp apples such as Fuji or Granny Smith are usually used for this purpose while softer, grainy-textured apples are not preferred. Caramel apples can be sprinkled with nuts or small confections. Caramel apples are often consumed as treats on Halloween because this festival falls in the wake of the apple harvest. Caramel apples should not be confused with candy apples. These two confections are made using distinctly different processes. Candy apples are made by coating an apple with a layer of sugar coating. To celebrate the National Caramel Apple Day and treat your children on Halloween, try your hand at making taffy apples. Chill 10 medium apples in the fridge and insert a wooden stick into each apple. In a saucepan, combine 2 cups packed brown sugar, 1 cup butter, 1 cup light corn syrup, and 14 oz sweetened condensed milk. Cook, stirring constantly, about 30 minutes. Remove from heat and stir in 2 tsp vanilla. Dip each apple into caramel, turn to coat and set on buttered wax paper to cool.